Home > EXHIBITIONS > Solo Exhibitions > Mr. > The World of "Nobody Dies"
The World of "Nobody Dies"
©2008 Mr. /Kaikai Kiki Co., Ltd. All Rights Reserved. Kaikai Kiki, the company led by the Japanese art scene’s top name Takashi Murakami, has at last launched itself into the world of film production. And it’s only fitting that the man standing at the helm of this inaugural project, produced and distributed entirely in house, is Murakami’s most famous protégé – a man with fans the world over – the artist Mr. Known for his paintings inspired by Japan’s anime and idol culture, Mr.’s influences take on a fresh new life in the bodies of real live actresses, resulting in a cinematic world that is unlike any you’ve seen before. Reflecting today’s eerily peaceful Japan, a country which has forgotten the horrors of war and in which guns make little or no appearance in everyday life, our heroines are attracted to the innocent play-war of survival games. 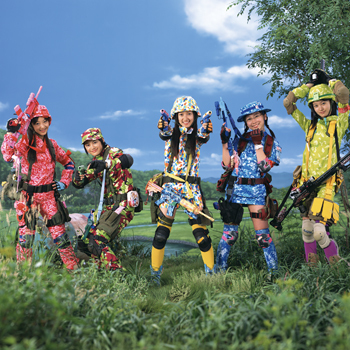 Not only that, they engage in these games wearing super-cute battle outfits and decorative guns. And yet, it’s possible that this colorful surface masks a deep vulnerability. Mr.’s Title “Nobody Dies” reflects the artists view of modern day Japanese women, who must fight their own daily wars and struggles for survival. At only 30 minutes long, this distinctive pop-explosion of a film is a true must see and to celebrate its opening, Kaikai Kiki Gallery will be holding a commemorative exhibition “called The World Of Nobody Dies” which presents the film’s unique universe as a series of art installations. See the movie and then further immerse yourself. We hope you look forward to it.